Diana Abu-Jaber's work is smart, moving, funny and brilliantly written, and she's also one of the warmest and most generous writers on the planet. 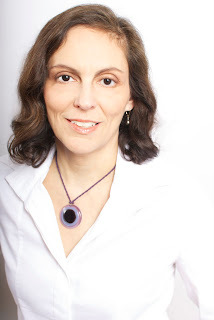 She's the author of the award winning memoir, The Language of Baklava, the best-selling novels Origin andCrescent, which was awarded the 2004 PEN Center USA Award for Literary Fiction and the American Book Award. Her first novel Arabian Jazz won the 1994 Oregon Book Award and was a finalist for the PEN/Hemingway Award. A frequent contributor to NPR, she teaches at Portland State University. Birds of Paradise, about family, Miami, a runaway daughter, delectable baking, loss and longing, knocked me out. 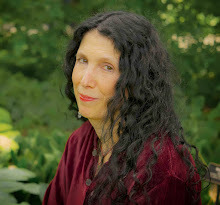 I'm so honored to have Diana here--and I want to mention that I reviewed this novel for Shoptopia.com, a review which will come out mid-September. Diana will be in NYC reading at the great McNally Jackson on October 10th. Thank you so much, Diana. I love the way Miami is so vivid in the pages—the lushness, the edge of danger—all captured perfectly. What made you decide to set the novel there? The easiest answer is that we live most of the year in Miami. But of course then it gets more complicated-- there are all the tiny sensory details of this city that spilled into the book. There was the day when I was sitting in the back yard, eating croissants, reading Chekhov instead of writing, and noodling around watching the tiniest ants racing up the latticework of my orchids. Somehow these creatures led me to visualize a woman in a professional apron; her back was to me; I could see she had strong shoulders and I knew she had an iron will. The moment came, in some way, from the discreet sensual elements of that setting. There were several run-ins with several neighbors' pet tropical birds that became part of the plot point. And to me, thematically, Miami is the sense of secrecy, of hidden communities, the warrens of downtown, the crime scene, a uniquely manic real estate market, the vast, grotesque disparities between economic classes, the powerful environmental beauty....This is such a potent, stimulating place it's almost impossible to live here and not have it imprinted on one's work. At the same time, we'd only lived here for five years when I started writing the book, which gave me a bit of an edgy distance--useful for artistic perspective. At the same time, writing the novel became part of my own attempt to learn how to love this city. A lot of times novelists have no idea where books come from, but I have to ask anyway. What idea sparked this novel? I think one of the biggest inspirations for me was simple fear. My husband Scotty and I were finally talking about starting a family and I was thinking a lot about all the things that scared me about parenthood. We were both in our forties and I wanted to understand what had kept us away from the question for so long. At the same time, I'd been reading about runaways and human trafficking and all the ways that young girls get into trouble, and so the book eventually grew out of these parental nightmares and anxieties! 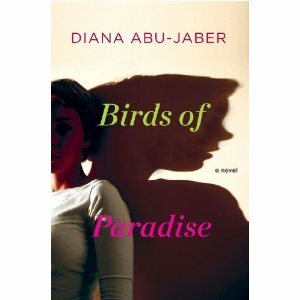 Birds of Paradise dips into the lives of a myriad group of characters without missing a beat, instantly involving us. Was this a structure you decided on right away, rather than giving it over to one distinct voice? Thank you, Caroline-- I'm so glad to hear that. As I recall, I'd started the novel with only Avis, the mother's, perspective in mind. Years earlier, I'd written another novel from three perspectives that never really coalesced: I put years of hard labor into it but ended up shelving the manuscript in misery. So I was highly motivated not to try that approach again. Then I'd read several novels from multiple perspectives that I'd loved, like Claire Messud's The Emperor's Children, and Colum McCann's Let the Great World Spin, and I think that approach started to work its way into my imagination. One day, after I'd written most of the opening segment with Avis, I heard her daughter Felice's "voice" very clearly in my head (even though it's a third-person perspective) and I decided to take the plunge into shifting points of view. I have to comment on the food details because my mouth was watering at the pastries and the organic food market! I bet research on that was fun, yes? Absolutely! I grew up in a family of serious bakers: my Irish-German grandmother was sort of obsessed with baking and she'd turn her home into a bakery every year from Thanksgiving until New Year's Day. I inherited the sugar-fiend gene and there's not much I like better than giving over whole mornings, days, to baking. I love the meditation of it as well as the reward. Much of my actual research came from years of interviews and study I did when I was a food writer for the Oregonian newspaper. I wrote a restaurant news column and was particularly fascinated by the pastry chefs, how they often got second billing after the chefs and owners, but how many of them were actually sort of driven mad-geniuses. There was one pastry chef in particular who'd been recruited from Alain Ducasse who become notorious: he'd order insanely expensive ingredients, no matter how the owners would plead with him, and create such achingly beautiful creations that people almost couldn't bear to eat them. He got fired all over town and finally fled back home. Chefs like this-- their quixotic passions and obsessions--were great inspirations for Avis' character. Felice , the daughter who ran away, was so sympathetic, despite some of her actions, and so achingly real, that I’d love it if you could talk about how you build character in your books. It seems that, for me, building character is very much like building relationships in real life: there may be an initial spark, a beguiling trait, or moment of seduction, but there is also-- if I'm lucky-- a long, slow unveiling. In real life, we present public faces to each other and it takes time to peel away the layers, to learn about each other's history, past, motives, oddities. When writing characters, it's like the process of friendship runs in reverse: you slowly accumulate the details and history, layering them, stacking a series of transparencies, building their minds and bodies into three dimensions. I tell my students, you want to write characters that will cast shadows, characters that have breath and spirit. I often take walks to think about my characters, what they want, what they will do next. Sometimes I talk them over with my husband or another writing friend. On occasion, I'll write about them in my journal, create a sort of shadow diary to follow the novel and help me to investigate the deeper currents. I often write brief, secret back-stories or free-write about the characters and their motives. At some point later in the process, I lean heavily on writing friends-- a group, if I'm in one-- to tell me what's missing, what's off, what's odd. And I shuffle back and forth, erasing, filing in, erasing, filling in. I try to be patient. I've been at work on another food memoir, a sort of follow up to The Language of Baklava. When I set out, I'd thought it was going to be about trying to raise a good, multi-cultural, adventurous eater. But as I've gotten into it, I actually seem to be writing a book about negotiating the tensions between being a writer and a parent and a woman. I've been going back in time, retracing my first teaching job at the University of Nebraska, writing about old relationships and conjuring up madeleines and meals of times past. It's funny, but I find writing memoirs an intensely evocative, visceral experience-- as if some part of my mind literally reoccupies those old places and feelings. It's sometimes wonderful and sort of dizzying and often very hard to relive some of those old times-- sort of like being swamped by the past. At the same time, all at once I'm pulling out those old favorite cookbooks--the Moosewood; Chez Panisse; The Golden Palate; and I start wanting to make the things I cooked back in the 90's-- odd, passing fancies--a certain pretzel or stew or cake. 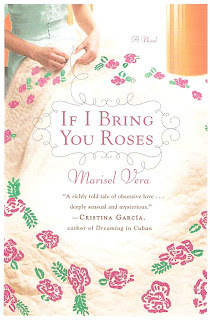 Marisel Vera's novel is a bittersweet love story, set in the 1950s and a haunting chronicle of Puerto Rican immigrants in Chicago. I loved the novel so much, I wanted to bring Marisel on my blog, and she graciously agreed to write something. Thank you so, so much, Marisel. As the oldest daughter in a traditional Puerto Rican family, one of my chores was to iron my older brother’s clothes. I did the worst job I could short of burning them, hoping my brother would tell my mother he would iron them instead (That never happened.). I snuck MS magazine into the apartment and stayed up late into the night sitting on the toilet and reading it in our only bathroom. I plotted to run away from home and show up on Gloria Steinem’s doorstep and ask her to adopt me. I didn’t do that, but I fought my own personal struggle of being a feminist in a culture where girls are raised to be subservient, first to their fathers and brothers, and later to their husbands. When I went to college, I did my best to hide that I was a Puerto Rican from Humboldt Park, a Chicago neighborhood where riots had recently shocked its citizens and the entire city. It put me on the defensive even when fellow students asked me ordinary questions. “Where are you from?” made me cringe. How to answer without bringing to mind the image of burning cars or that of a mother and small children leaving a demolished store with stolen goods in the middle of the night? Some people, especially adults, reevaluated their first impressions of me but, to my surprise, most people seemed unaware of the riots. At first, I was relieved. But then I was appalled that a number of Puerto Ricans from Humboldt Park had felt so oppressed and disenchanted that they had resorted to rioting and their suburban neighbors hadn’t even noticed. This confirmed what the women’s movement had already made clear to me, I lived in one world and everyone else lived in another. My cultural and family upbringing was part of me and while I embraced it, I didn’t have a solid foundation of what being Puerto Rican meant because my parents were taught American history in school in Puerto Rico. Without that foundation, I couldn’t help feeling inferior when people questioned my right to American citizenship or when I read or heard negative stories about Puerto Ricans. My extensive research about Puerto Rico and its history has also deepened my pride in my ancestry. Although by this time in my life I know who I am, it took my research for If I Bring You Roses for me to learn about the events that resulted in Puerto Ricans migrating to Chicago. A little knowledge of Puerto Rican history growing up would have given me some ammunition when kids taunted me to get back on the banana boat. 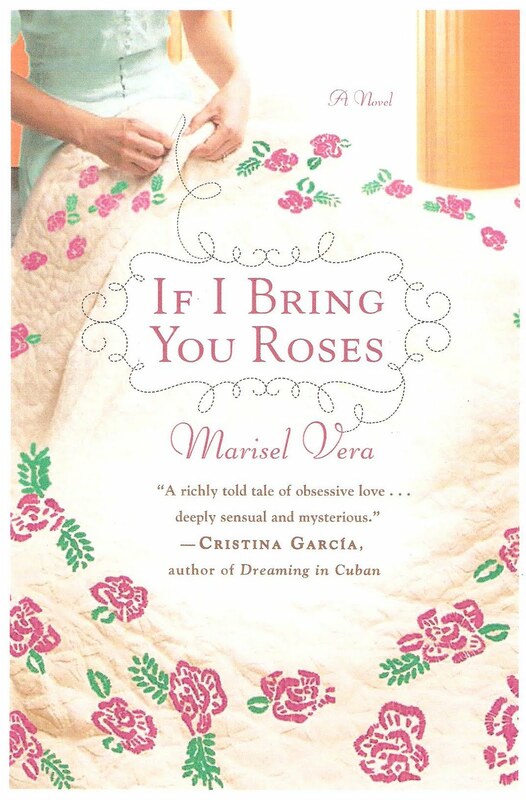 Yet If I Bring You Roses is an American novel (as I am American) about Puerto Ricans (as I am Puerto Rican) who migrated to 1950s Chicago. It’s a story about a marriage, about love and heartbreak, about immigration, about assimilation, about Puerto Rico. If I Bring You Roses is about America. Right now, I’m starting a new novel, and so much of that is about character arcs. What makes a person the way he or she is? How does he or she change and how can I show that? I always keep photographs of what I think my characters look like pasted around my desk, right down to what kind of clothes they wear. 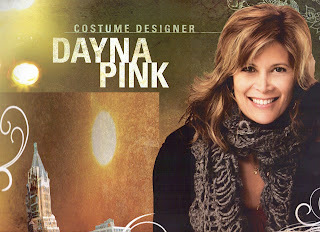 That’s were Dayna Pink, the phenomenally gifted costume designer of Crazy Stupid Love, The Uninvited, Hot Tub Time Machine, and the upcoming The Lucky Ones comes in. I so loved Crazy Stupid Love, and part of it was the clothes. It wasn’t just that I seriously coveted Julianne Moore’s green dress, but I loved the way everyone’s clothing also seemed to tell a story. Being an intrepid googler, I tracked Dayna down and asked her if I could talk to her. 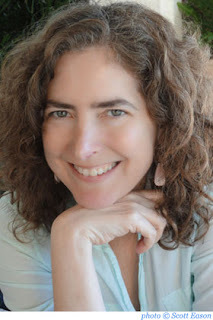 I had a seriously great time because Dayna’s not only fascinating, she’s also funny and whip smart, and I loved what she had to say about creativity and crafting a story. Thank you, thank you, Dayna. So how do you do what you do? I started as a stylist. I always loved clothes. I did a lot of bands, a lot of celebrities. I worked with Tenacious D and then I had an opportunity to do a film and I began to realize how different it was. When I was a stylist, my job was to make someone look good or cool or beautiful. That’s not costume design. Costume design is about the story behind the person. Where are you from? Where did you travel? Did your grandmother give you that necklace? For example, in dressing the kid in Crazy Stupid Love, I asked, who is this kid? Is he popular? Does he have friends? It all plays a part in how he dresses. Kids don’t have a huge wardrobe, and actually the actor was much hipper in real life than we made him! When you read the script, you look for the character arc, the transformation. Sometimes it’s subtle. A woman falls in love and she might dress more confidently or sexier. It’s collaborative and I have a lot of conversations with directors, and actors. It all boils down to this fact: what we wear tells the story of who we are. Depending on the film, eight or nine weeks. You have to research, make boards, figure out the whole direction. What about you? How do you orchestrate your own wardrobe? I live in L.A., which is pretty casual. I’m always shopping more for other people. I think because I’m involved in fashion, I’m interested, but I wouldn’t say that I’m trendy. I’m still a jeans girl. I usually don’t wear heels, but lately I’m obsessed by my Prada striped platforms. Do you try to influence what your friends wear? Oh no, I don’t think that way at all! And actually, bad taste is so much better than no taste. That’s what makes this world interesting, the differences, how people choose to present themselves in the world. If everyone was all wearing perfectly fit trousers with Prada, everyone would certainly look great, but it wouldn’t be as interesting. It’s like saying everyone should have plastic surgery and get these nice tiny noses. What’s interesting about faces is always the character, not the perfect nose. When, I’m not on a movie, I really try to take care of myself. When you’re on a movie, it gets really crazy and it can be really tiring. I also want to spend time nurturing my relationships with my girlfriends and my daughter, as well as doing yoga and learning something new. I feel better when I have a minute to care for myself and the people around me. I know writers are always worried that they don’t have another book in them, that the well will run dry. 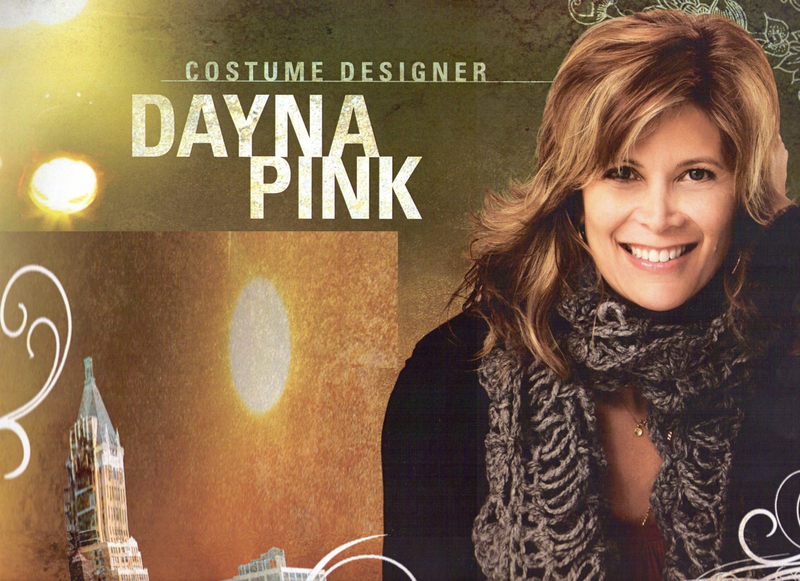 Is it that way for costume designers, even a highly successful one like you? Everyone worries that they will never work again. It takes a certain type of person to work for him or herself, and to take that chance. When you’re creative, you can’t do anything else. You have to do what you are supposed to be doing, and if you can realize this, then part of the worry is gone. You just need to know that this is the path you’ve chosen. For me, the art is on the body, in clothing. That’s my passion. I really want to meet you so you can correct my wardrobe! I would be lost without the other writers I use to read and tear apart...um I mean critique..my work. (I want them to tear it apart, by the way.) But I've learned that you need the right person reading your work: someone who doesn't try to turn your novel into his or her novel, someone who understands your strengths and weaknesses, someone who spurs you on to greatness. But not everyone gets lucky so easily. So where do you find critique partners? 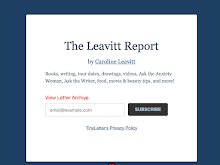 Ladieswhocritique.com is a completely free site for women writers looking for the exact right partner to critique their work. The Brainchild of Laura Pepper Wu, this site lets you do a search for someone in your genre whom you might be critique-compatible with. So get motivated, stay on top of your writing and improve fast! Maddie Dawson's The Stuff That Never Happened is a Target Emerging Writers book, and it's also wise, witty and very, very smart. I'm thrilled that Maddie is here on my blog to celebrate the paperback edition and to talk about writing. Thank you so much, Maddie! Basically, I get up in the morning and over a cup of tea try to evaluate whether it’s going to be a good “writing at home” day or whether I’m going to need to pack up the laptop and get to safety. A bad day for writing at home used to be one in which the phone rang incessantly or the children needed to be driven places. But these days it seems to be up to the hawk population of Guilford, Connecticut. I work on my screened porch, you see, overlooking the woods, where until recently it was cool and quiet, even a little boring. Then a couple of hawks made a nest in the willow tree by the porch, which I thought was lovely. Some company! But now they have invited all their cousins and BFFs and just about every hawk they know in the tri-state area, and all of them have taken to setting up housekeeping and making new families there. (The Guilford school system is known to be quite good.) Take it from me: hawks have noisy, messy family lives, and they sound like pterodactyls. Not only that, but they’re also pretty keen on looking for food—and perhaps I’m getting paranoid, but I have noticed on a few occasions that if I’m sitting too still for a long time, several hawks have tried to throw themselves at the screen, perhaps to eat me. So lately I can often be found writing at Starbucks, where it’s true that there are lots of distracting human situations that can interfere with truly productive novel-writing—but at least no one is considering having me for lunch. 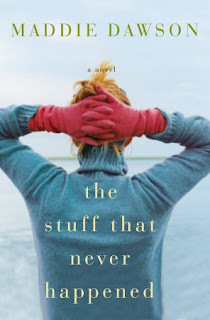 Have there been any big surprises since your novel, The Stuff That Never Happened, was published? I always thought the best part of writing a novel would be the wonderful day that you get the very first copy to hold in your hands, but it turns out there is another thing that’s even more fun, and even more long-lasting. It’s that people start talking to you about your characters’ lives—you know, as if the characters you thought up were real people, who exist in the world. Of course, I have always believed in them—Annabelle and Grant are sometimes more real to me than some of my family members, but I still was shocked when a woman came over to me at Starbucks one day, plunked the book down on the table in front of me, and then started to cry as she described all the ways Annabelle made the same mistakes she had made in her own life. Now what could be better than that? 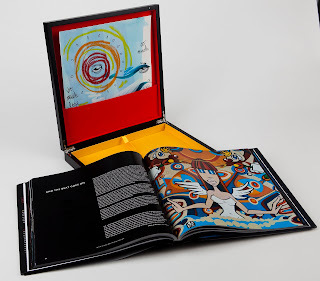 It’s way better than holding a copy of a book in your hands. I think I was born writing, if such a thing is possible. My mother tells me that when I was four years old, she and I were out planting flowers, when I suddenly said to her, “I hope you know this isn’t how we did it in the Navy.” Until then, she hadn’t known about my Navy career—and since we didn’t know anyone who actually was in the Navy, she wasn’t exactly sure how I knew about my Navy career either. She felt it best to drop the subject. Then, when I was six, one day she refused to give me money for the ice cream man, so I marched inside the house and wrote a little book. I made a binding and drew pictures for it, and titled it “The King Who Slept for 3 Hours and 45 Seconds,” a tragedy about a king who took a nap and missed his coronation. I took it door to door until a neighbor bought it for twenty cents—which in those days was enough for two banana popsicles. My mother was embarrassed about this and went and bought it back and told me never to do this again. But I remember thinking that this really could be a good career move for me. At least it could keep me in frozen desserts for the rest of my life. Since then, I’ve been good for very little else. I am non-mechanical, can’t fix things, hate gardening—and although I can make a decent pie crust, I’m generally not in the mood to do it. I’d rather write than do almost anything, and although sometimes I envy my friends who have the kind of careers that don’t have them staring off into space and mumbling all the time, I really do love what I do. Today I can be seen pacing and mumbling to myself as I write a new novel, and I’m lucky enough to lead writing workshops in my home, helping other people figure out the madness that is fiction-writing. It’s so much fun helping others take apart their manuscripts and come to finished drafts. But it gets my fingers itchy to get back to my own work. Is The Stuff That Never Happened your first novel? No. I am the author of three other novels and three books of humorous non-fiction about parenting, published under the name of Sandi Kahn Shelton. 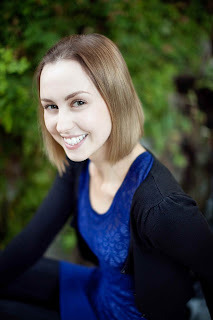 Maddie Dawson is actually a pseudonym, chosen specifically for this book, because my other novels (What Comes After Crazy, A Piece of Normal, and Kissing Games of the World) are all novels with young protagonists, and fell more into the genre of “chick lit,” stories about 30-somethings falling in love and finding where they belong in the world. When I was writing The Stuff That Never Happened, I decided to use a pseudonym since it’s a book about a woman approaching 50 and taking a hard look at her life and deciding whether she wants to stay in a marriage that may be heading off the rails, or whether she wants to go back to a man she once loved. What I’ve discovered is that it doesn’t matter what name is on the cover—I love writing and connecting with readers and other authors, and these days that’s mostly how I spend my time. I have to say, it’s also a little bit fun, even though exhausting, to be two people. Some days there’s barely enough of me to be even one person. That being said, I believe it’s Maddie who’s working on “our” new novel: the story of a 40-something woman who discovers she’s pregnant for the first time just as she’s separating from the man she’s loved for 15 years. Well, it’s probably not the financial rewards or the fame and glory. And maybe not even the peaceful, sleep-eight-hours nights. (I often dream the plots of my books and find myself needing to get up and write stuff.) And it’s definitely not the sanity it brings: writers (and me among them) tend to be obsessive-compulsive worriers who are gifted at dreaming up problems, both in fiction and real life. We’re also constantly walking around with little pieces of napkins and paper bags and post-it notes, upon which plot points and character traits are written in a kind of shorthand that defies logic. I have one currently that says: “Soapie yoga bloody Marys,” which I know means something important. 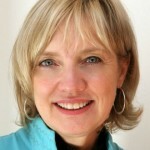 I now turn over this blog to a kind of unique promotion, from Laura Harrington, author of Alice Bliss. Laura's inviting everyone to be a part of "Where's Alice Bliss?" 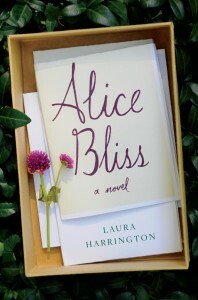 If you are a teenage or adult book blogger, you are invited to request a copy of Alice Bliss through lauraharringtonbooks.com. Click on the “Where’s Alice Bliss?” page and fill out the submission form. The copy you receive will have a bookcrossing book plate on the inside with our “Where’s Alice Bliss?” logo. Please go to www.bookcrossing.com to register your book and get your book’s unique bookcrossing ID (BCID). Put the BCID in the space provided on the bookmark. 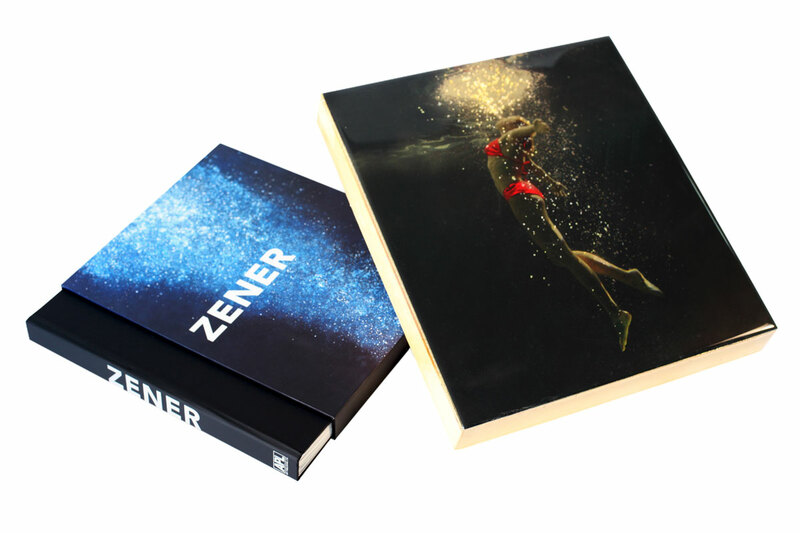 This number will allow you to track your book’s journey. ALICE BLISS is a "People Pick" with 4 out of 4 stars. ALICE BLISS: "The Best Books of the Summer" Entertainment Weekly. ALICE BLISS has been selected for the Barnes&Noble "Discover Great New Writers" program.